PokerStars (www.PokerStars.com) got its start over a decade ago and is now the world’s largest poker site for both tournaments and cash games. Their game selection is rivaled by no other poker site and even the most obscure games can be found with players seated and ready to play. For a little perspective, it’s rare to log in to PokerStars and find fewer than 100,000 online. PokerStars is the biggest online poker room in the world, and is able to offer features and luxuries that other poker rooms cannot afford. For example, there are rarely less than 100,000 players online at a time, so there are thousands of cash tables, sit and go's, and tournaments to choose from. Plus, if you sign up at the PokerStars poker room with marketing code MIK500, you will automatically receive a 100% up to $600 deposit bonus over your first three deposits at the site. As the home to more WSOP Main Event winners than any other poker site, PokerStars has a strong lineup of big name poker pros. Daniel Negreanu, Greg Raymer and Chris Moneymaker all call PokerStars home and they can occasionally be found playing online. The focus at PokerStars is definitely on tournaments but there are also more cash game tables here than anywhere else on the internet. New players who sign up at PokerStars and use the marketing code MIK500 will receive a 100% deposit bonus for up to $600 extra, which can be spread over a player's first three deposits. This bonus essentially doubles the first three deposits every new players makes at PokerStars. New players will find the bonus useful as they get used to the games, and experienced players will appreciate the bankroll boost. The deposit bonus is released in $10 increments by playing in real money games and earning VPPs. Every time 170 VPPs are accumulated, $10 of the bonus is cleared and released. Players have a generous six months in which to clear the entire bonus. Overall, it’s a nice, big bonus and is one of the most lenient in its requirements. There are three ways to earn PokerStars VPPs - by playing real money cash games, real money sit and go's, and real money multi table tournaments. At cash games, players earn VPPs based on the amount of rake collected per hand. At tables with eight or more players, the table is awarded six VPPs per dollar of rake. Then, the VPPs are equally distributed between each player who was dealt into the hand. So, if you were at a table with nine players and a pot was raked $3, each player would receive two VPPs ($3 rake x 6 VPPs/$1 = 18 VPPs/9 players = 2 VPPs/player). At cash games with seven or less players, the table is awarded 5.5 VPPs per dollar of rake. Then, the VPPs are equally distributed between each player who was deal into the hand (just like above). Sit and go and tournament players earn 5.5 VPPs per dollar of tournament fees. So, if you enter a $50+$5 tournament, you will earn 27.5 VPPs (5.5 VPPs/dollar x $5). Learn more by reading our PokerStars bonus guide. One major positive feature is how customizable the software is. 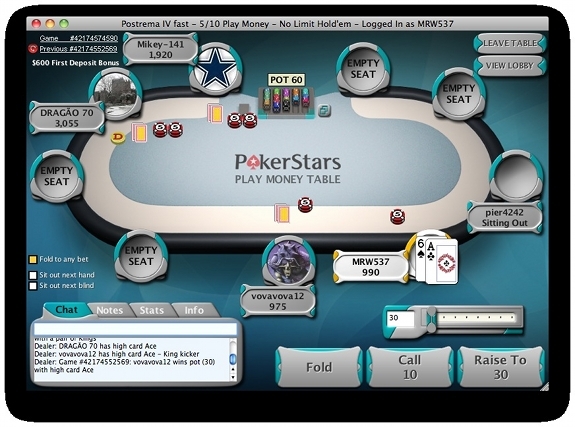 Players can choose from a variety of unique skins and backgrounds and can even upload custom avatars for the tables. Four color decks make it easy to spot flushes and poker tournaments allow for final table deal-making. In that regard, the PokerStars software show a clear advantage over the competition – few poker sites facilitate deal making. This section of the review pretty much writes itself. PokerStars is easily the biggest and best site for poker tournaments, bar none. Full Tilt Poker comes in next but even they can’t compete with PokerStars’ massive weekly Sunday $1,500,000 guarantee, its plethora of satellite tournaments, and constant array of new events. As far as tournaments go, there’s really no comparison between any other site and PokerStars. Tournaments can be found at all levels, ranging from free to several thousand dollars. A new tournament is always starting so it's easy to log in and play no matter what time of day it is. Texas Holdem tournaments are the most popular of course but PokerStars also hosts hundreds of tournaments in other game types every week. Games such as Omaha, Seven Card Stud, Badugi, Triple Draw, and mixed poker all have a spot in the PokerStars tournament lineup. The variety isn’t just limited to game types, either; the types of tournaments also vary. For example, players can play in deep stack tournaments, turbo tournaments, heads up tourneys, shootouts, large guarantees, satellites and more. Tournaments with million dollar prize pools are not at all uncommon. PokerStars has more players online than any other online poker site. As the biggest poker on the Internet, PokerStars has a worldwide audience and nearly always has more than a hundred thousand players online at a time. At the time of this writing, there were 235,929 players logged in and 36,721 tables running. The difficulty of competition at PokerStars varies by quite a large degree. There are just so many players here that all skill levels are represented. The low stakes ring games and MTTs are soft and probably always will be soft. The games do get progressively tougher at higher stakes but not any more so than at any other poker site. PokerStars has a huge list of deposit options that are offered on a country-by-country basis. International deposit options such as credit cards, eChecks, and e-wallets are available for both US players and everyone else. A few of the most popular eWallets include Neteller and Moneybookers. Players can log in and visit the poker cashier to find a custom list of deposit options. Withdrawals options are also just as varied. Players can get their money back through the same method they used to deposit in most cases. Wire transfers, eChecks, and paper checks are fast and efficient. Players who deposited with an eWallet can also have that same wallet credited back when it’s time to cash out. PokerStars has an excellent customer support team, but the only method of contacting them is e-mail. Fortunately, e-mails are always answered promptly and professionally. To date, PokerStars has yet to drop the ball on a legitimate customer complaint. It’s an incredible reputation and is a significant factor in PokerStars’ success. Ready to Play? Visit PokerStars to Get Started Now! Now that you know everything about PokerStars.com, it's time to get started. Sign up at PokerStars with marketing code MIK500 to automatically receive our exclusive 100% up to $600 sign up bonus.